Former Duck Farm will be Transformed into Suffolk County Park While Preserving Environmental Habitat. 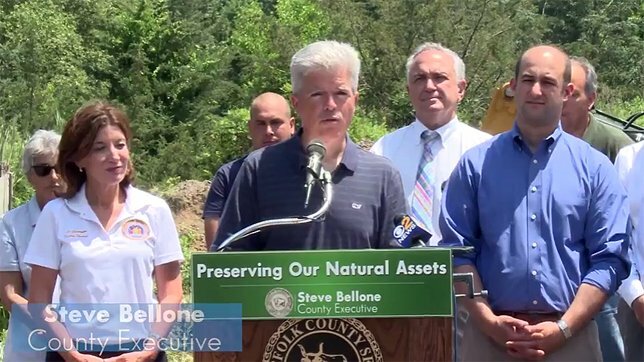 New York State Lieutenant Governor Kathy Hochul and Suffolk County Executive Steve Bellone at a press conference announcing the Mud Creek Watershed Aquatic Ecosystem Restoration Project. Suffolk County, NY - June 22, 2017 - New York State Lieutenant Governor Kathy Hochul and Suffolk County Executive Steve Bellone today announced that the Mud Creek Watershed Aquatic Ecosystem Restoration Project will begin remediation to transform a former duck farm into a state-of-the-art Suffolk County park. The project, which is expected to be completed in two years, will feature a nature trail signage kiosk, a nature trail, interpretive signage, and a boardwalk that will allow residents and visitors to traverse through the revitalized wetland areas. The Long Island Regional Economic Development Council in 2016 awarded the Mud Creek restoration project more than $2.2 million through the New York State Department of Environmental Conservation. This state funding will help restore the habitat at the headwaters of Mud Creek on the site of the former duck farm owned by the Gallo family. The project will restore fish and wildlife habitats within the east branch of Mud Creek as well as the freshwater wetland and upland habitats. In addition, these REDC funds will allow Suffolk County to launch the planning and implementation of various projects, including transportation, water quality improvement and marine life preservation, job training in the medical field for residents and many more. Suffolk County contributed more than $2.3 million to fund the study, design and construction phase of the Mud Creek Project. The County has has already allocated $1.7 million to renovate the site that was once occupied by several duck farms, which has left the Mud Creek wetlands and uplands negatively impacted by the build-up of contaminants from decades of duck farming. Successful completion of the project will restore the fish and wildlife habitats within the East branch of Mud Creek as well as the freshwater wetland and upland habitats. The total amount in funding from all sources devoted to the project including the initial study and design phases is $4,876,459. Mud Creek park lands and waters were prevoiusly owned and operated by Gallo Duck Farm from 1922 to the mid-1980s. Prior to duck farming, the area contained streams, swamps, and woods with the East Branch of Mud Creek flowing through the duck farm property. The Suffolk County Department of Economic Development and Planning, in conjunction with the Suffolk County Department of Parks, Recreation, and Conservation, initiated a feasibility study in 2011 to evaluate environmental restoration opportunities at Mud Creek County Park. Comprehensive studies of the degraded ecological and physical conditions followed by feasibility assessment and public outreach have culminated in a “shovel-ready” project with construction drawings, specifications and regulatory permits for comprehensive restoration of degraded aquatic and terrestrial habitats at Mud Creek County Park. New York State’s Regional Economic Development Councils were created by Governor Cuomo in 2011 in an effort to jumpstart the economy and promote job creation. This initiative has redesigned the state's approach to economic development from a top-down model to a community-based, performance-driven approach where community, business and academic leaders develop long-term strategic plans tailored to their region’s unique strengths and resources in order to spur economic growth. Subject: LongIsland.com - Your Name sent you Article details of "Lieutenant Governor Hochul, Suffolk County Executive Bellone Break Ground On Historic Mud Creek Restoration Project"